I've maintained this blog for just over three years, and I wrote the following piece nearly two years ago. While I hate to rehash yesterday's news, recent fishing trips have me thinking about the value of wild fish, and the inherent foolishness of many stocking programs. I'm curious to hear what you folks think. Is there a place for stocked fish? What's your experience? 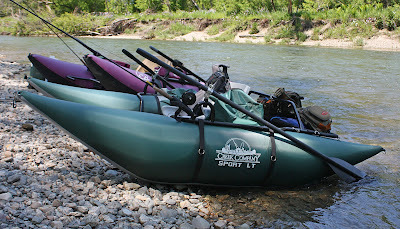 We had a chance to float the river, and for a change the weather played its part. It was a beautiful day, even if the river was just a touch on the high side. The fish didn't come easily, but they came often enough to make things interesting. You should see the frustration and terror on a bug chucker's face when one of these things begins to lose air and sink ... funny, at least when it's an easy fix. 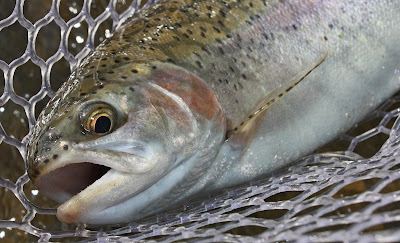 Best fish of the day came in at just over 20" and crushed - of all things - a foam wiggle minnow. So ... I originally wanted to spend the day chasing warmwater fish ... I have to admit this isn't a bad substitute. Hard not to love the way the light was hitting the adipose. A mixed bag just to keep things interesting. 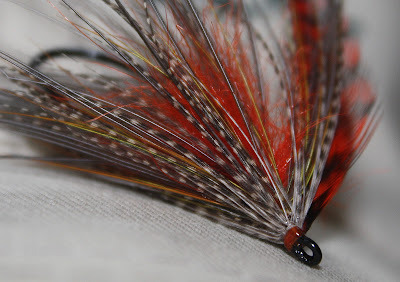 Fly of the day - if we're calling it a fly - no one has ever accused me of being a purist. 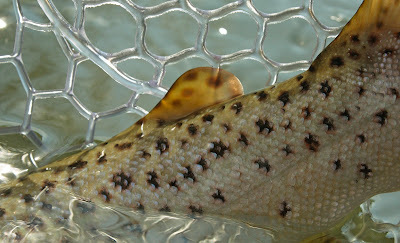 I follow quite a few blogs, 90 percent of which are at least tacitly related to fly fishing. More often than not, I enjoy the time I spend thumbing through the digital pages. Some days are better than others, but all things considered, it isn't a bad way to spend an otherwise fishless afternoon. 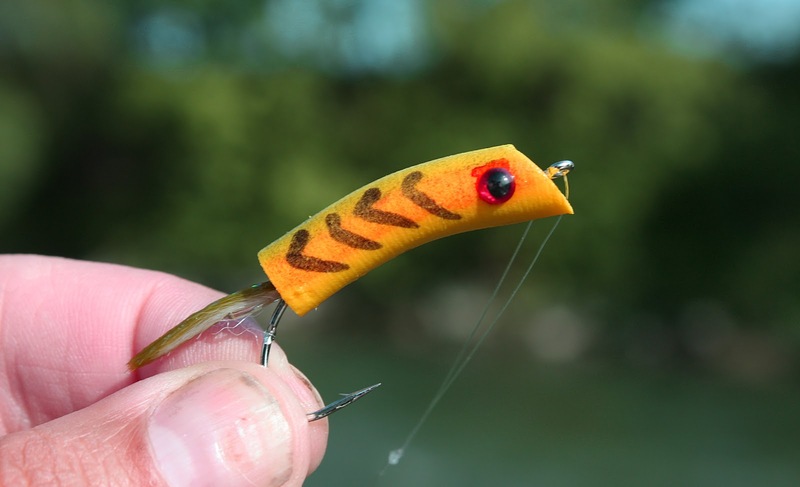 One of the bloggers I follow recently wrote a piece lamenting what he referred to as, "the insufferable quality" of the writing that many fly fishing blogs share. I've no way of knowing if this particular writer has ever laid eyes on my blog. If he has then I have to wonder if he finds my scribblings as shallow and insipid as the writing he describes in his post. But I have to say that my experience couldn't be more different from his. 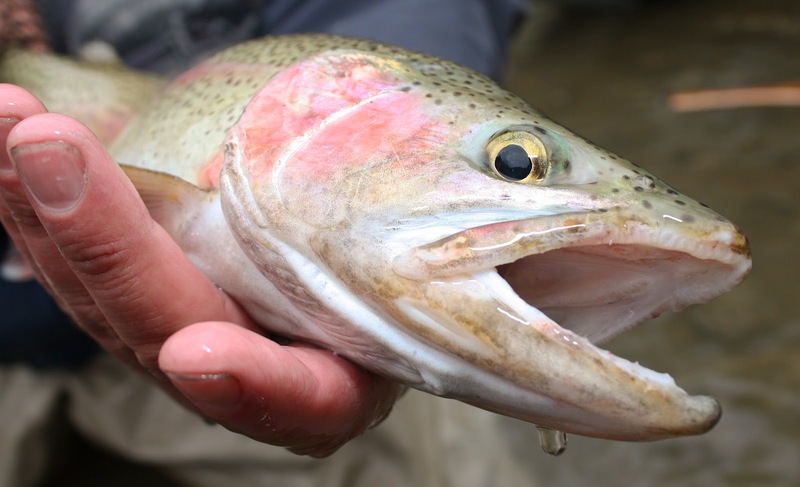 I've found there to be some really good stuff out there, written by folks who are both adept writers and seemingly talented anglers. 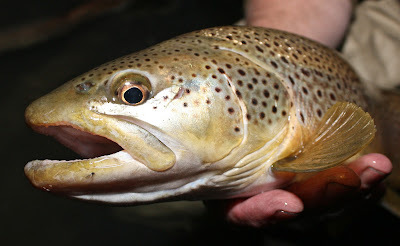 More than anything else, however, the writing is enjoyable to read simply because fly fishing bloggers - at least those I follow - are genuine. Unlike published authors who derive a portion of their income from writing, bloggers have few extrinsic motivations for doing what they do. Certainly, there are a select few bug chuckers who have figured out how to turn blogging into a business. I commend them for their entrepreneurial spirit, but these folks are far and away the minority. Most bug chucking bloggers have no incentive to write anything that is not personal and spontaneous. 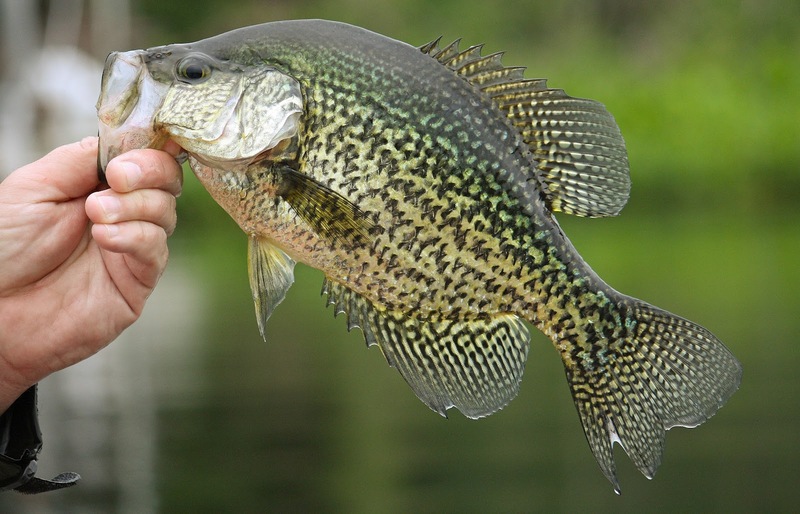 They fish because they enjoy fishing, and they write because they enjoy writing. 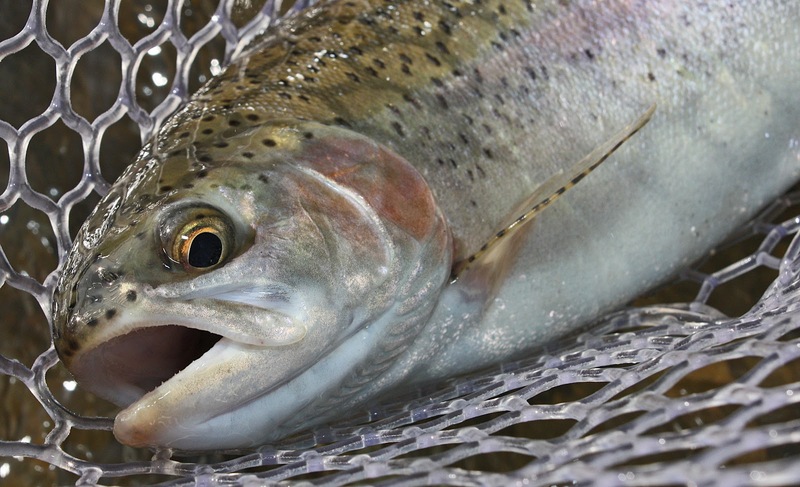 Blogging about fly fishing is simply the inevitable collision that occurs when two interests gravitate toward each other. And while it is true that a blogger's writing may seem at times amateurish and unpolished, it is also true that a lack of professional finish often appeals to the readers of blogs. As a rule, bloggers are raw. Bloggers are real. Bug chuckers who blog sometimes drop their rods too low on the back cast; they miss too many hook sets ever to call themselves experts. 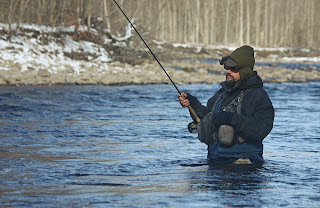 They tie flies albeit poorly, and they tear holes in their overpriced waders. They're every bit like the rest of us. 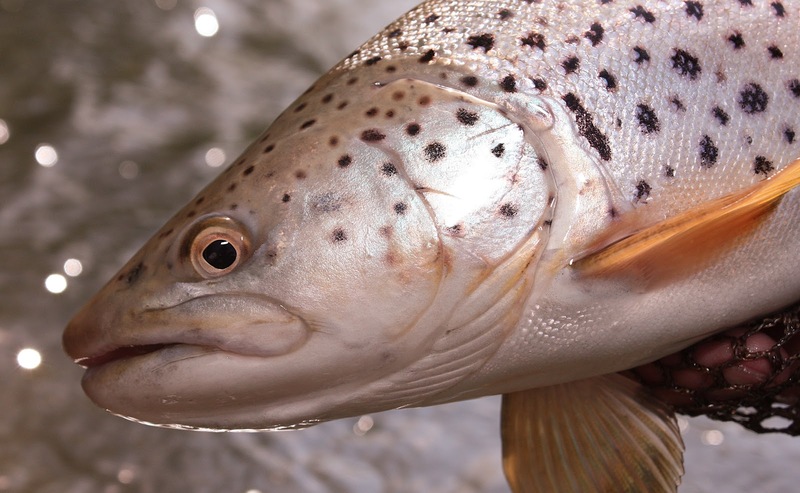 Contrarily, I think the canon of published fly fishing writing is - for lack of a more suitable word - contrived. So much of it is cookie-cutter, and very much the same as everything else. Many of the fly fishing books we might purchase on Amazon.com or in the local fly shop, read like DIY texts on roofing or bathroom restoration. They lack distinct form. 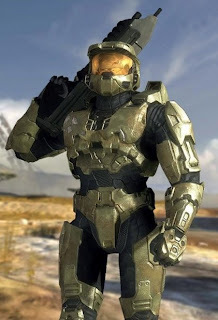 They lack style, and this may very well be because they're so polished and heavily edited. Blogs bring us the unedited, often unvarnished truth. Please don't take this as a blanket condemnation of professional writers; it is not meant to be. I'd be lying if I suggested that I wouldn't want to earn my living as some writers do. 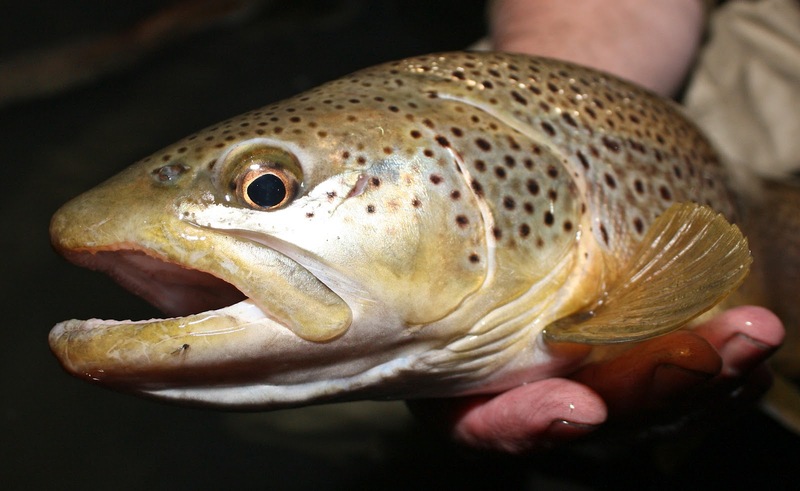 And I realize that the history of fly fishing is rich in literature and the writers who produce such writing. What I am most emphatically suggesting, however, is that blogging and bloggers - many of whom are much more talented than myself - have given us a new means by which we might better learn and appreciate our sport. 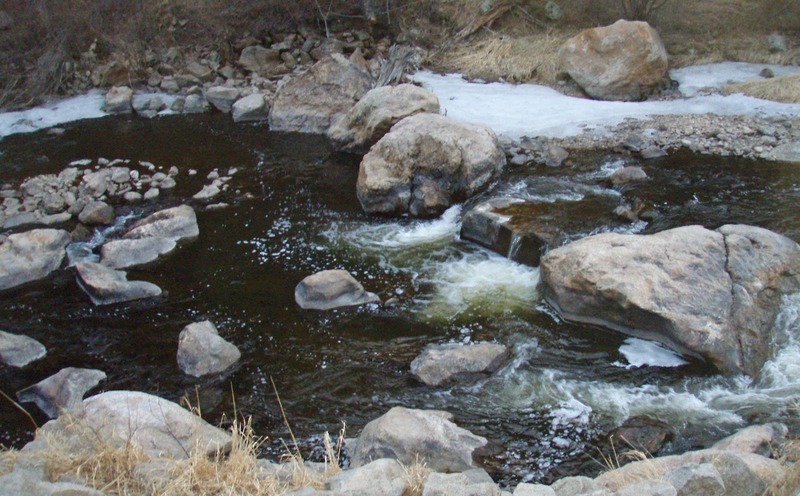 There's a nondescript span of river that has been something of a fish factory for as long as we've waded its currents. It's a genuinely special run that rarely sees a bug chucker; in all the years I've fished the Flat (yes ... capitalized, proper noun ... she's special enough to be given a name) I've only ever met one other angler there, and he was using spinning gear and moving too quickly to be particularly effective. The Flat is like the very ordinary friend of the most attractive woman at the party in that she's often ignored in favor of water that appears more promising. Like that plain looking woman, however, the Flat will pay off in droves if you just give her a little of the attention she so deserves. The Flat is about as long as a soccer field, which - for those uninitiated heathens amongst us - stretches roughly 20 yards farther than an American football field. At the head is a short but powerful riffle; above that riffle is a very deep pool. Below the flat is another large pool, this one shallower and longer than its big brother at the head. We've caught fish - big fish - in both of these pools, but our efforts have always focused on the the flat water in between the two. 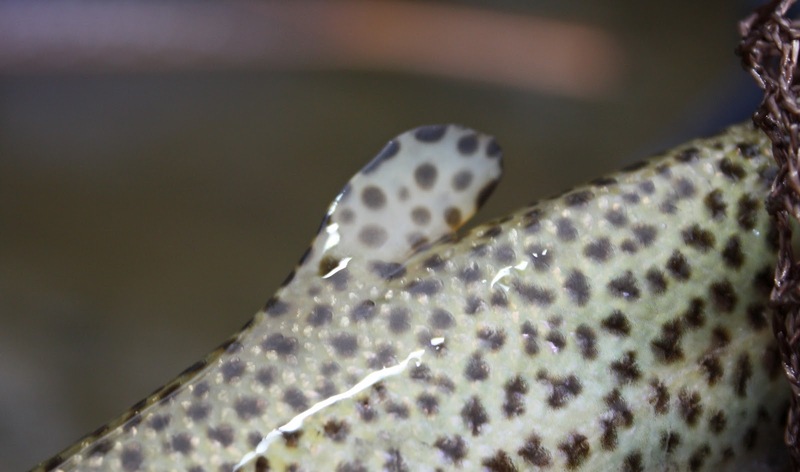 Imprinted on the parchment of my memory is the indelible impression of the first trout I ever saw rise on the Flat: a brown of some twenty-two inches. The fish first appeared in the pool below the run, but with relative quickness he worked his way to the tail end of the Flat, slurping hendrickson spinners as he went. Perched on a bank high above the water, I watched until I could no longer play the part of spectator. The fish swallowed my spent wing pattern on the first cast, and fifteen years later I still frequent the run looking for rising fish. 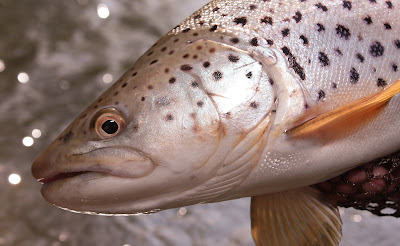 And even though the Flat's fish will crush stripped streamers - and I don't use the word "crush" euphemistically, the strikes are decidedly vicious - it is the dry fly fishing that brings us back. 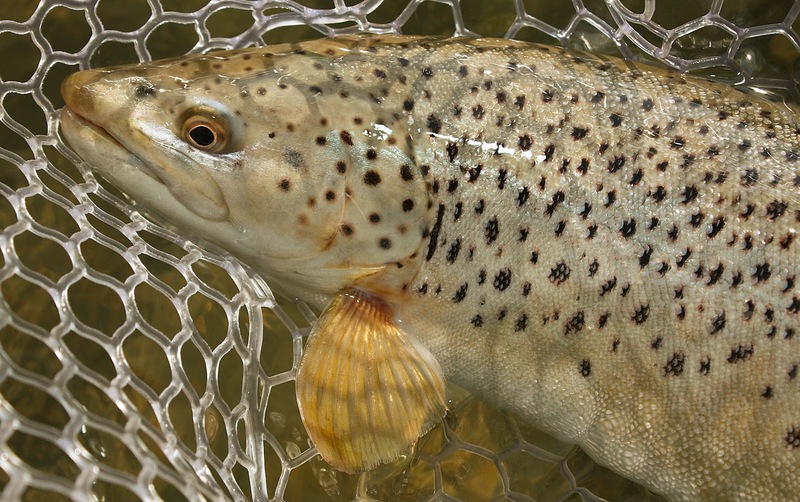 The best of the Flat's fish rise like they do nowhere else on the river, which means the Flat may be the river's best dry fly water. Nose, back, tail ... Nose, back, tail ... Nose, back, tail. The dance begins with the emergence of the season's first hendricksons, and generally continues unabated until the sulphurs begin to thin. I spend the better part of the winter chasing steelhead if only to help me get through to the spring and rising fish on the Flat. 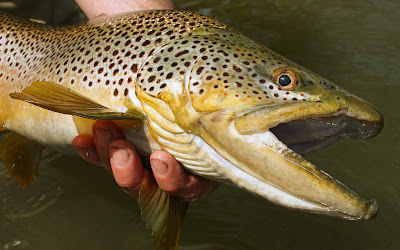 It is amazing - simply amazing - to think that I can be completely isolated from the world, and casting parachute emergers to large, wild brown trout, less than one hour from the capitol city of New York State. That's the thing about the river, and perhaps it's the same for any river. Each run is a galaxy, vast in its way but still only a very small part of the much greater universe. The Flat, the Falls, Converse, the Bends, Betsy's Run, Confluence, the Bridge, the Pullout, and Ballpark ... each run and pool, each riffle and each flat, has its own particular charm. 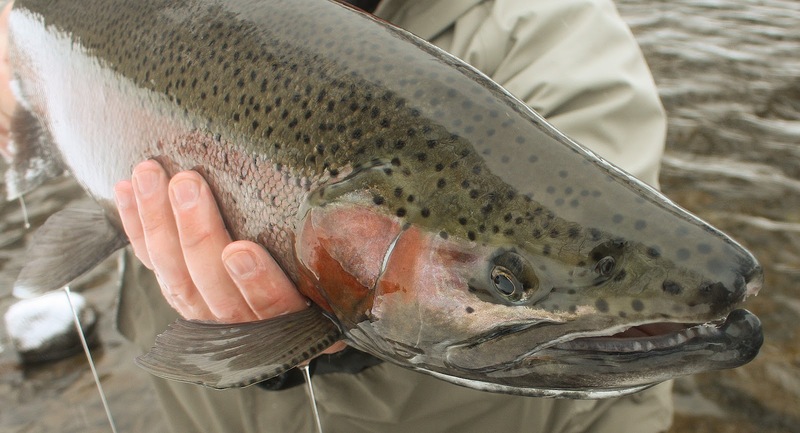 We fish them all in their respective seasons because we've spent a lifetime learning those seasons. And as the Flat's season reaches its height and hendricksons give way to sulphurs, I find myself thinking that there are much worse ways to spend a lifetime than by wrapping bits of fur onto bits of wire, standing waist deep in icy water flowing through a river bed that was carved by the last ice age, and watching fish rise out of their element and enter ours, to feast - however briefly - on the bounty provided by a river that so nourishes us both. I was proud to be an infantry soldier, a grunt serving in the Army's, First Infantry Division ... as the saying goes, "If you have to be one, be a Big Red One." 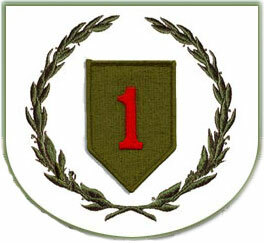 But being a trout bum at Fort Riley wasn't all bad. To the west, within a weekend's pass and a day's drive, were the Colorado Rockies and the type of fishing that made me think of home. Of the places I visited during my tenure as a soldier, my favorite may have been Rocky Mountain National Park near Estes, Colorado. RMNP is an amazing place - perhaps the only national park I've visited that rivals Yellowstone for its beauty. 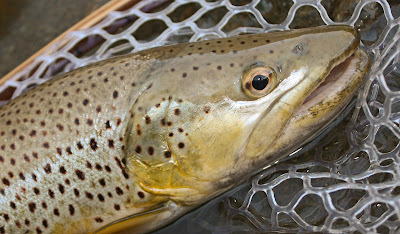 Recently, my good friend and fishing partner, Ben Jose - proprietor of Benjamin Bronze Studios - had the opportunity to fish a day in the area just outside RMNP. Hearing the excitement in his voice in the days before his trip reminded me of how I felt the first time I made the drive from the flatlands of Kansas to the mountains of Colorado. What follows are Ben's recollections of his all-too-short time in the Centennial State. 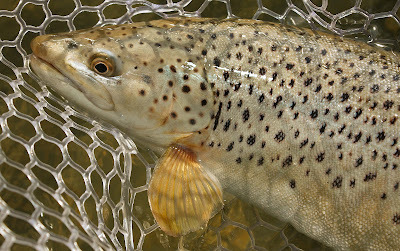 As an avid reader (and bug chuckin’ partner) of The Rusty Spinner, it has been a joy of mine to fish the tributaries to the Great Lakes, The Battenkill, The River That Shall Not Be Named, and other water filled ditches, and then open up this blog a few days later to read the Spinner's interpretation of our outing. So … When Rusty asked if I would share with his audience, a few of my recent experiences, I was all too happy to oblige. During a business trip in March of this year, I was given the opportunity to throw my line over some of the most beautiful water I've ever seen. 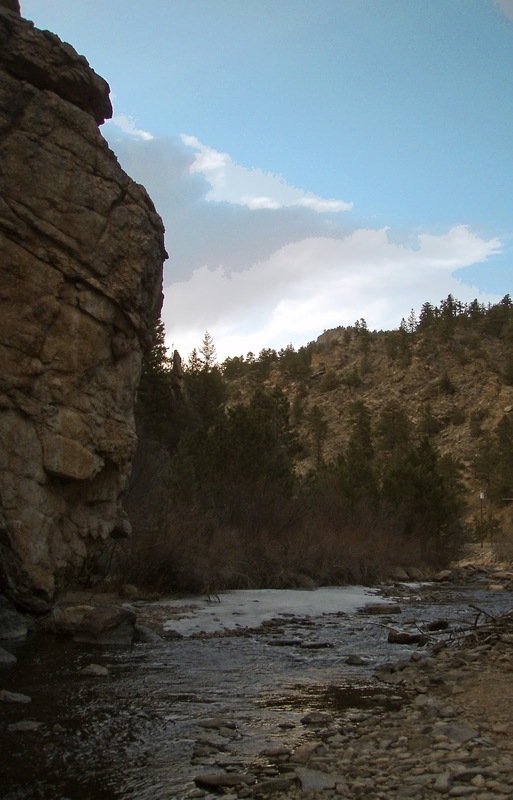 At the direction of Jeanne Toussaint - Colorado resident and sister of the angle - I fished the Big Thompson River just downstream of Rocky Mountain National Park. I was overwhelmed by the beauty of the canyons and the water. 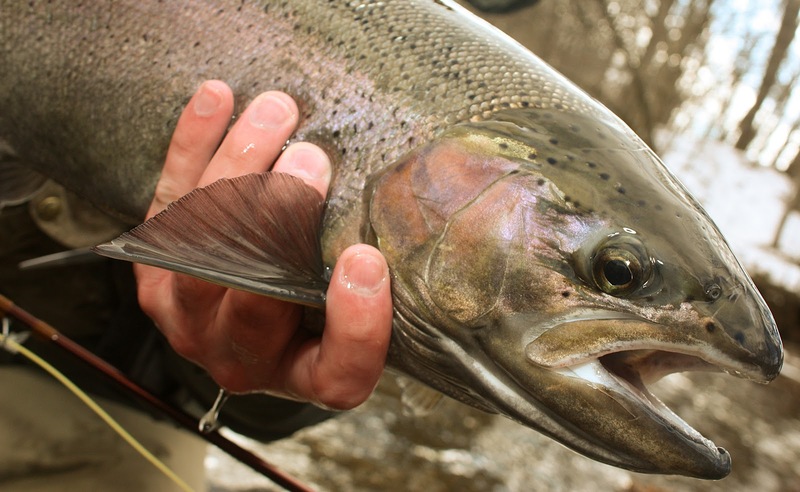 But this blog is not entirely about rivers, the rocks, or the fishing in between … this blog is about the kindness, camaraderie and pity we bug chuckers sometimes extend to each other. I locked up the brakes in front of the Elkhorn Fly Rod and Reel in Loveland, CO, and barely negotiated the the parking space at the building's front. I was hoping that when I walked through the door, I would be met by the friendly face of fellow bug chucker who willingly would share some information about local fishing. I wasn't particularly optimistic as my travels have taught me that all too often the folks working behind the counter at the fly shop are tight lipped and reluctant to give up the goods. I suppose these folks probably have their reasons, although I've never fully understood them. As I entered the shop, I was greeted by a friendly “Hello,” from Casey, the employee working that day. I returned the greeting, and tentatively, I laid my boxes - and my pride - down on the counter, and asked if my eclectic assembly of small nymphs would be suitable for the Big Thompson, a little stream flowing just west of town. In the kindest way possible, Casey let me know that even the smallest of my bugs might be, “a little too big.” I am not sure whether it was Casey’s good nature, his amusement at having had a look inside my boxes, or just the fact that he wanted to see a chucklehead from New York hook up with a Colorado fish, but he gave me solid advice and good directions to a few of the better spots on the stream. For this I am genuinely grateful. A sincere “Thank You” goes out to Casey and to Brian Chavet, the owner of Elkhorn Fly Rod and Reel. 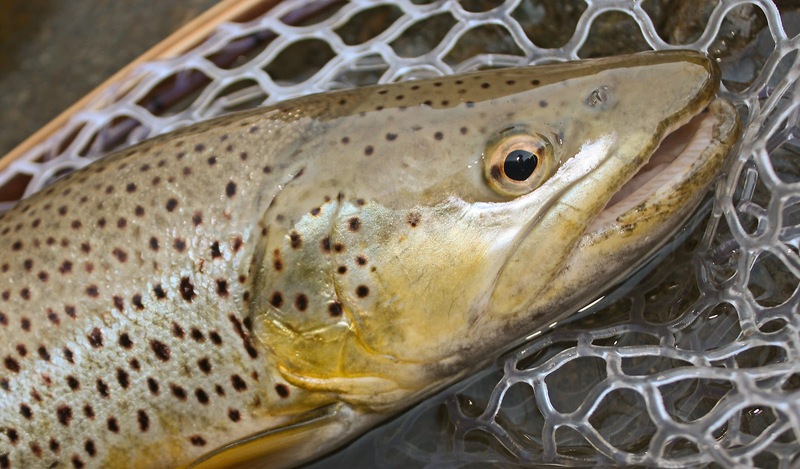 They should know that I was able to land a couple eager fish on their flies, and that I better enjoyed my time in Colorado as a result. If you are ever in Loveland, be sure to stop in to Elkhorn … you’ll be happy you did. 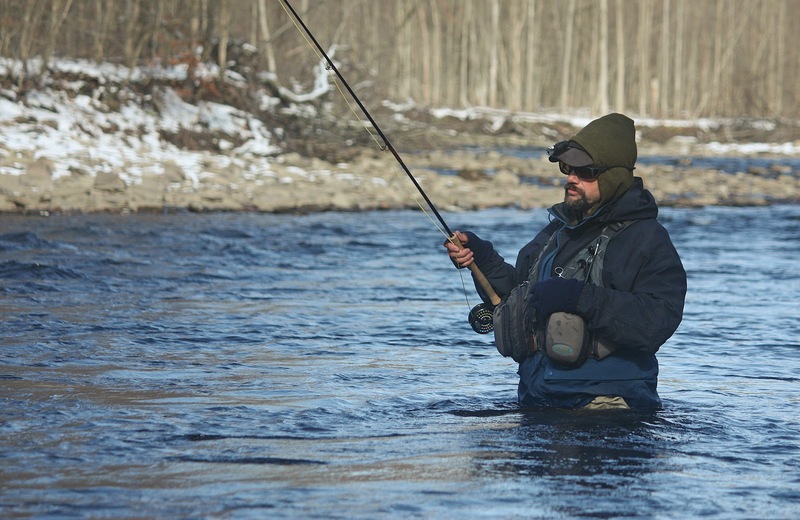 I should note that one day before I fished the Big Thompson, I was wading the trophy section of the Battenkill in New York, and that I caught the first fish I've hooked there in nearly 15 years. Altogether, it was quite a way to spend a weekend.